The more baby sleeps, the better baby will sleep. Sleep begets sleep. Do not think you can keep baby up for hours and then get a nice long nap or long night sleep. Baby needs lots of sleep. Many moms worry that if their child gets too much sleep in the day, they won’t sleep well in the night. Well, part of that is true. Too much sleep can cause nighttime sleep disruptions. However, you are unlikely to run into that issue until possibly 5 months of age, and only if you aren’t dropping a nap when your baby needs to. A common trend among modern parents is to keep baby up all day in order to get baby to sleep well at night. This just doesn’t work. 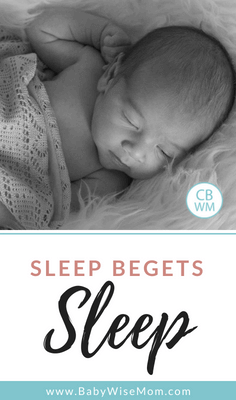 Tracy Hogg, in Secrets of the Baby Whisperer, says “…being overtired will actually ruin her sleep” (page 168). Ezzo and Buckman in On Becoming Babywise assure parents their babies need to sleep. They need to sleep for physical, emotional, and intellectual reasons. The better rested your baby and child is, the better they will sleep overall. That is one reason I suggest you use alternative methods of sleeping during sleep training (so long as it doesn’t interfere with the overall process) see Waking Early From Naps/Won’t Fall Asleep For Naps. If your child gets overly tired, she will cry longer before naps and have a harder time sleeping. Hogg says, “…when she finally does sleep, it’s fitful and abbreviated, sometimes no more than twenty minutes, so she’s cranky practically all the time” (page 168). As the parent, you are in charge of establishing these good sleep patterns. You can’t wait for your child to ask to take a nap (some children might, but a small percentage, and only when they are really tired). Now at some point, your overly tired child will crash and crash hard. He will finally sleep long and hard. But this is a rare occurrence in the overly tired child. Let me illustrate this point with a recent experience we had. We went to Yellowstone National Park. We left at 3:30 in the afternoon, which was later than we had anticipated. We had hoped to leave by 2:00 or 2:30. Because of that, we had decided to not put the kids down for a nap. We then drove to Yellowstone and arrived at 9:00 PM. Our kids don’t sleep in the car, so despite the fact that they had missed a nap and were late for bed, they still hadn’t fallen asleep. We got settled and they were finally both in bed at about 10 PM (Kaitlyn–16 months–was a bit earlier). They both slept fine that night. The next day, we had Kaitlyn take her morning nap in her bed, then set off for seeing the sights. Brayden (3) again missed his nap. Around 6 PM, Brayden actually fell asleep in the car for about 20 minutes, and woke up crying. That is the third time since he turned one he has fallen asleep in the car. We were there with friends (who incidentally don’t do schedules or naps) and the dad observed that our kids probably don’t sleep in the car because they know they will get to sleep in their beds. We got back to camp and the kids were put to bed in good time. My husband and I went to bed at 10:30. A few minutes later, Brayden woke up crying. He woke up almost every hour that night. That has never happened in his lifetime. He wasn’t sick or scared or cold, he was just tired. He wasn’t even really fully waking, just crying for a minute then going back to sleep. We decided that from then on, he needed his nap. We had Kaitlyn skip her morning nap one day to get more sightseeing in, but only once she was rested enough. After a couple of days of naps and good bedtimes, the kids were both back up to par. There was one day Kaitlyn asked for an extra nap. We were cooking dinner so I gave it to her–she is one of the small percentage of children will ask for a nap. When we got home, poor Kaitlyn was so tired. She had solo playtime at 5 PM but instead took a 1.5 hour nap (woke because I woke her) then went to bed at 7:30. Sleep begets sleep. Believe it. If my 3 year old boy who has had good sleeping habits for 3 solid years can get that disrupted after a couple of days of lack of sleep, be confident your newborn can also. Believe that enough sleep is good and important for your child. This is so true. The other day I was trying to keep my little one up a little longer and she was clearly tired. It took her a long time to get settled back down and when she did – she only took maybe 1 hour naps all day. She is 6 months old and usually takes 2 two hour naps and then one 1 hour nap in the late afternoon – then goes to bed at about 7:00 at night. When I put her to bed that night she screamed and cried for a little while (maybe 15 minutes, which is a long time for her – she usually doesn’t cry when going down anymore). I got her up, changed her diaper and sat with her for a moment to calm her down. When I put her down again, she screamed like I have never heard before. She was SO overtired. It took maybe 3 minutes of that and she was fast asleep. What a great post. I can’t even count the number of times older moms (mostly grandmothers) have told me to keep my baby up later if I want her to sleep in later. As we know – that is not the case. Thanks for your added experience Traveling Turtle! When Abby was a month old her doctor actually suggested that I keep her up during the day to help her sleep at night. Can you imagine keeping a one month old awake all day? Needless to say, I ignored that advice! Research has shown that if you keep a baby/child up late or skip naps in the hopes of getting them to sleep longer at night they might at first, BUT over a short period of time will then start to sleep much worse at night. Maybe this is why some people thing this method will work, because it sometimes does at first. I have a question. For almost the past week, my one baby (7 months, 5 adjusted) has been waking up between 3 am and 4am and will talk for an hour an a half to herself. I just let her be. She is not hungry, no dirty diaper, etc. Her naps were weird on the weekend before but now back on track with 3, 2 hour naps during the day. She still needs ALL naps or she is exhausted. Is there a reason for this? Will she stop eventually? According to both Babywise and Baby Whisperer, this is a normal thing at this age. Since she is in need of nothing, the best thing to do is just let her be. She should stop doing it before long. Thank you, thank you, thank you for this blog. It has been so wonderful to read (especially on my Blackberry at 3:00 a.m. feedings). I have a 23 1/2 month old son that I did BW with and he STTN for the first time when he was 6 weeks old and for good after he was about 8 or 9 weeks old. I would have to wake him up for a 3:00 a.m. feeding until he was 5 weeks old and then I started to let him wake up naturally. I now have a 5 week old son. From the beginning, he has woken up 2 times per night to eat. He usually wakes up around 2:00 a.m. and 5:00 a.m. He has woken up one time in the night about 4 times since his birth. Until he was 3 weeks old, I had him on a 3 hour schedule but I switched him to a 2.5 hour schedule thinking that would help him wake up only once at night. I feed him at 6:30/7:00 a.m.; 9:00 a.m.; 11:30 a.m.; 2:00 p.m.; 4:30 p.m.; 7:00 p.m.; and then between 10:15 & 10:30 p.m. for a dreamfeed. He has waketime after all of his feedings except for the dreamfeed and usually his 2:00 p.m. feeding (he is just so sleepy during this time even if I try to get him stay awake for 5 minutes after eating). He usually does not nap for more than one hour between his 4:30 & 7:00 p.m. feeding because he has a fussy time but this is getting better each day. At night, he wakes up crying to eat but after he has eaten goes right back to sleep each time. Am I doing something wrong? I am starting to feel like I am because my first son was so different. His normal waketimes including feeding during the day are around 1 hour each time. I feel like he is never going to STTN if he is still waking up two times to eat. I know he is gaining well and that my milk supply is adequate. Any ideas or encouragement you could offer would be wonderful. Also, I have a very, very hard time getting him to eat more than 5 minutes at his dreamfeed. He usually eats for 5 minutes on one side, then my husband gives him a fake diaper change (because we change him to wake him up in the first place) and by the time I have him back in my arms, he is fast asleep and will not wake up to eat again. Two of the times he only woke up once in the night were last weekend and he only ate for 5 minutes at these dreamfeeds as well. I try everything to get him to wake up to eat more. He actually eats more at his 2:00 a.m. feeding. Any ideas? Thanks again. I'm at my wit's end – for the past couple of weeks my now 7 week old son has had trouble with naps. I have looked high and low through all of your great information, and have yet to find a solution for him. He refuses to sleep through most naps, and I would let him CIO, but the problem is is that he isn't crying, just laying in his crib (which I am thankful for, so at least I'm not having to listen to crying for hours on end). Every now and then I hear a few fussy noises from him, but for the most part he is just looking at everything and moving around. I've tried extending and shortening his awake times and that hasn't worked; I've tried finding less stimulating things for him to do during his awake time, as well as fairly stimulating things; I've also tried holding him and swaying until he's drowsy (usually he squirms and cries while I'm holding him, but the crying seems to wear him down some, although not for long); I gave up swaddling for a while because he didn’t seem to like it, but we’ve started that again and it seems to help a tiny bit, but still not enough. Nothing seems to be working :o( I get maybe one good nap out of him a day, and the rest are hopeless… if he sleeps at all for them, it's maybe 30 minutes. Any suggestions? Alicia, sorry! I was never notified of your comment. Let me know if you still have questions. lwicks, I am not sure! It sounds like being overly tired. Will he sleep in a swing? 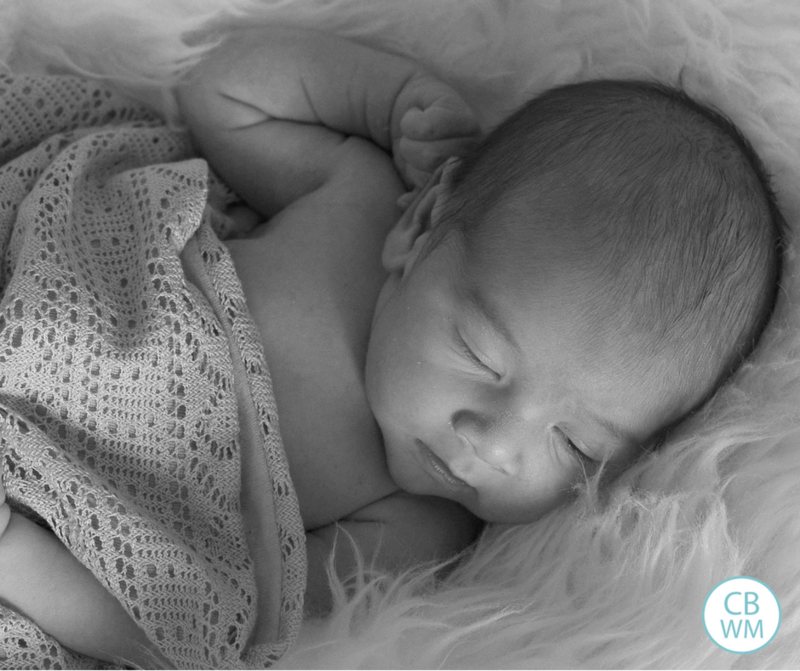 Hello – I love this blog and spend a lot of my baby’s naptime on it! My baby is 9.5 weeks and has been “sttn” since about 7.5 weeks. When I say she is sttn, she is sleeping til about 3-4am then waking and then self soothing herself by sucking her thumb. She is then falling back to sleep but occasionally stirring in the morning (around 5-5.30ish) but usually awake at 7 (if not half an hour before). She doesn’t break into a cry but does fuss and whimper before she finds her thumb. My first question is – is she consistently sleeping through the night when she is waking like that? My second question is – do you think she could be ready to drop the cluster feeding? I am currently cluster feeding her at 4,6,8 and then dream feeding at 10. I would like to move back to feeding at 4 and 7 as she is terribly unsettled between 5 and 7 as she doesn’t tend to nap at all in the two nap time slots but am too nervous to drop the cluster feeding and have her not “sttn” – suspect its trial and error but if you have a view, I’d be interested. Rosie,Yes to your first question. All babies (and all people) wake several times a night. She is waking and able to put herself back asleep, which is great!The Baby Whisperer says to drop cluster feeding at 8 weeks, so she should be ready. I know this is an older thread, but I was hoping I could get some advice! My son is 9 weeks (6 wks adjusted) and right now his optimal awake time is right at 1 hour. If I can catch him around 55 minutes or so, I can put him down for a nap and he quietly puts himself to sleep. If it gets to be 1hr 10-25min, then he will fall asleep and fuss, sleep, fuss, and all that for 30-45 minutes or more before he can fall asleep (usually being rocked by that point). I know I need to be more mindful of his wake time, but my question is: when he DOES get overtired and takes like 1 hr to get to sleep, then should I let him take his typical 1hr 45min-2hr nap or wake him up at the regular feeding time, if that was only 30 minutes later. Does that make sense? I feel like I should let him sleep and just roll the schedule, but didn't know whether it was better to wake him and try to get him back on schedule. Thank you!!!! Love this site!! Hello! Thank you for your useful blog! I haven't read the book but I'm very interested and willing to try the method. My second son is 7 wo now and I try to put him on 3 hours schedule. Started a week ago. Have​ not figured out how to help him sstn yet. He'll go to bed about 8 pm, I aslo tried to df him at 10 pm but anyway he wakes up at 12, 3, 4, 5 am to eat. CIO for this middle of the night wakes is not a good option, cause he sleeps in our bedroom, the other bedroom is my first 4 yo son. I need to wake up nobody.What should I do?Although, I need to leave at 7:30 to kindergarten, we walk there, the youngest in a stroller. What is the best way to organize his start? Does he wake up 6:30 to feed and have wake time before going into the stroller? Isn't it to early?